Most conventional toilet bowl cleaners are made from strong acids or caustics that can cause serious burns to your skin. Seventh generation toilet bowl cleaner will clean as well as products containing these harsh chemicals without the risk of skin burns or damage to the environment. Seventh Generation Emerald Cypress & Fir scent toilet bowl cleaner is made from 100% essential oils and botanical extracts. This cleaner will freshen your toilet without creating harsh fumes. Ingredients: Water, lactic acid (plant-derived demineralizer), caprylyl/myristyl glucoside (plant-derived cleaning agent), xanthan gum (plant-derived thickener). Fragranced with plant-based essential oils and botanical extracts*. Emerald Cypress & Fir: Abies balsamea (balsam fir), citrus aurantifolia (lime), cupressus sempervirens (cypress). Effective cleaner without the chemicals! Love that Well has pretty regular sales on all Seventh Generaton products. my only issue is that it actually smells terrible. Not toxic fumes bad, but kind of gross at times. Works very well. The only product I use. No awful fumes, no harsh chemicals, and biodegradable - what more can you ask for? Love this! I really love this product and it's scent. It gets the job done and leaves the bowl shiny. I love knowing no harmful chemicals are going into my septic and this planet. Like the scent and the job it doesâ€” only criticism is that itâ€™s clear so takes some adjusting to see it in the toilet bowl (unlike the previous bright blue chemical stuff I was using). Love this cleaner and leaves the bowl clean and fresh. Would recommend this product to anyone. Effective product. Gets the job done. Nice light fresh scent! Product cleans well and has a very light clean scent. Effective without harsh chemicals. Would repurchase. 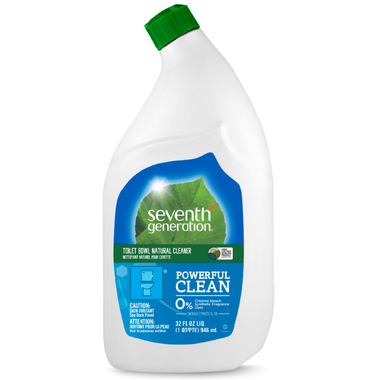 I'm a real Seventh Generation fan, and this toilet bowl cleaner does not disappoint. It is thick and clings to the sides of the bowl while I clean. The aroma is very pleasant. Nothing harsh, but you finish the job knowing that it's done well. I love, love, love this product. Finally I don't have to use corrosive materials to keep older toilets smelling fresh and clean. So far using weekly avoids build up so it's worth every penny. Great. A light clean scent compared to standard cleaners. For stain buildup I'm not sure if it's strong enough, but perfect for my weekly cleans. I'm happy to not have to air out the bathroom after using it! Jâ€™aime beaucoup ce produit, travaille trÃ¨s bien ! I bought this cleaner when it got suggested to me at the checkout, I figured Iâ€™d give it a try after trying several ones from stores, I love it! Other cleaners smell too much, so much that it makes you wonder how natural or green they really are. This one smells nice but not too much, it cleans amazingly compared to the other 3-4 kinds I had tried. Definitely recommend it. It works well and the smell is pleasant! It vvorks very vvell and smell good the pine. I am dedicated to using products that are safe for our home as well as the environment. This one is amazing. With chemical sensitivities, I've come to realize that a lot of so-called natural and eco-cleaners aren't as clean as they purport to be. This one, however, causes us no problems at all. Importantly, it does a very good job. As a bonus, it smells good. Seems to clean well, strong pine smell. Clear, so a little hard to see where it's applied, but I guess it's nice to know there are no artificial dyes. Great scent and works very well. This is the first time I have used this product-love it! I liked this cleaner. The large bottle is great. Love that it is non-toxic. Works well! This product cleans well and I quite like the large bottle. I wish the scent was a little stronger. Maybe I'm just too used to those harsh toilet bowl cleaners I used to use - but the scent they left behind let you know that the toilet was clean! But I do feel better about using this product, and it does the job just as well! I like this product. It does the job and is one of the cleaner lines out there. Would recommend. Does just as good of a job as those extremely toxic and chemical brands! Will be using it as my chemical replacement! I have started using this line of products and like the fact they are not too strong, and don't have a strong odour. This has no chlorine bleach. synthetic fragrance or dyes; but it still a skin irritant and there is a warning about this on the label - as there are warnings about most products these days. The dishwasher liquid and rinse agent had seals under the cap but this did not - so not sure if this is a problem to anyone. I would buy again. I was so surprised that this product did as good a job as the ones with all the chemicals. I'll definitely buy it again. Great product- really works on toilets and non toxic! I've been using this product for 2+ years and will continue to use it. Non toxic solution for the bathroom. The best results. This product smells amazing and does a great job cleaning. I am done looking for a good/natural bowl cleaner! I love all Seventh Generation products. This one works and smells great. I really like this product: smells great, does the job and without those harsh chemicals. Pretty good considering the brand. Smells great but would like it to be a bit more thicker. Very happy with this product. Cruelty free, environment friendly, smells good and cleans great! Re-ordered some to make sure i do not run out!!! I like the smell and using an environmentally friendly product. Will purchase again. Amazing product! Love that it's environmentally friendly, not a strong after smell and actually cleans. Would absolutely recommend! This is a great cleaner. Plus, it doesn't smell strong like most cleaners do. Leaves toilet sparkling clean and fresh. Scent is nice and clean smelling. While I like the scent of this product, I find it is too thin and doesn't cling to the bowl enough to my liking. I usually use Nature Clean Toilet Bowl Cleaner, and prefer it over the Seventh Generation formula for "cling-power". I feel like I have to use more of this than I did the Nature Clean cleaner. The scent is nice, though, and it does a pretty good job. I might buy it again, if it's on sale. This works well and is something I can feel good using, the smell was a bit stronger than I expected but not overpowering. I really like the scent, but wish it was slightly stronger and lingered a little longer. Seems to clean well.